Did you know Internet has an archive? Internet changes all the time. Thousand of sites appear and disappear. Those sites that survive go through plenty of changes. Wouldn’t it be cool to see those old or retired versions? Internet Archive Wayback Machine maintains a backup of Internet you can look at. Wayback Machine crawls Internet and archives all sites it sees (excluding those that have settings forbidding spidering and archiving of content). Archives are processed, sorted by date and accurately stored. With completely free access you can take a look at how any archived site looked in the past. Result are also completely linkable for ease of use. Ancient Google with ugly logo? Wikipedia running on original Usemod engine? It’s like child photo album for web. 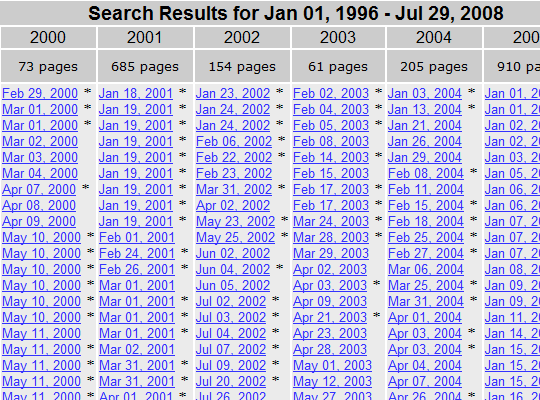 Unlike search engines that aspire for near-realtime updates Wayback Machine takes time. After site gets crawled it will take months for it to be processed and included in archive. Proejct does work that doesn’t seem real. However it works, works fine and offers you excellent research tool. It was interesting to see some of the history of madmouse.com because it is over eleven years old. It brought back some memories, some good and some not so good. Wow, eleven years is a looong time online. :) Impressive. I hadn’t messed with publishing for years after I got online, so my longest running online estate dates to 2003 I think. @Rarst – You just got to hang in there through the good and bad times and not give up. If something doesn’t workout right, regroup and try again. That is what I did. Crazy, over eleven years. Seems like just yesterday. I am more afraid to get bored, I rotate most of my hobbies every few years. Heh, people don’t start awesome. :) I am bit afraid to look at posts from only months ago here. What would I think about them after few years. I know this one and i will use it very often to see some sites. It’s site from alexa and Amazon i guess.Very useful site man. It’s connected to Alexa but Internet Archive itself is nonprofit organization. Great to know about this. Let me check whether my blog is archived or not. Rarst, I can see the archived copy from December 2007, when i started this site. But donno why the archive has stopped. after Feb 2007. what could be the reason? No idea. Your blog is properly indexed by Google, right? SO settings are fine. it may be simply slow – inclusion of archive copy to index may take 6-12 month according to them.